The fashion industry will always change and evolve to suit seasons and trends. To remain a constant in such a beautiful but fickle industry, one must remain ahead and unaffected by this continual change. 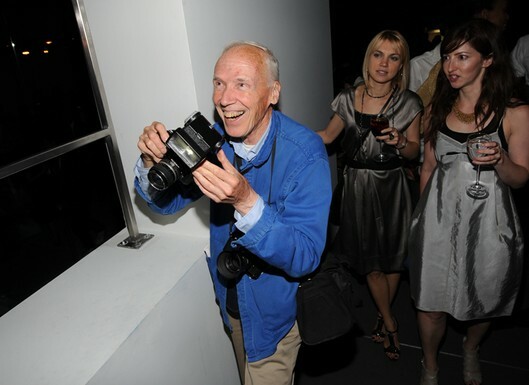 New York fashion photographer Bill Cunningham has done so for decades. Cunningham's regular column "On the street" for The New York times showcases his sharp eye for colour, style and originality. This column is not for celebrities, models or actors with their free clothes. It is for the everyday fashion aware people of New York: the dazzling, the daring and the different. Being a fashion photographer since the 50's has helped Cunningham understand the art of fashion and photography. With a memory for detail and an awareness for originality that only experience can bring, he brings an informed opinion to a very cyclical and trend ruled industry. He is a colourful subject and his positive view on life is the driving force behind this documentary. Despite his flair for capturing the flamboyant, Cunningham is a simple man on the other side of the camera. He takes his photos by riding his bike around the enormous expanse of New York City, or just by walking on the street amongst the people he loves to photograph. Dressing the same every day, he also lives very humbly. At the time of the documentary he is living alone in Carnegie Hall, where he has been since the 50's (Cunningham has since been forced to move out to make way for music studios). His tiny apartment is nothing but a mass of cabinets, filled with a rich history of his fashion photography. There is barely even room for his tiny single bed. It is a startling physical representation of the importance that he places on his work. One of the last artists to be living in the rent control apartments above Carnegie Hall, Cunningham talks lovingly of the bohemian lifestyle he has witnessed living there. Photographers, painters, actors and dancers have all have passed through the halls of the prestigious building. None are more colourful than fellow resident Editta Sherman. Snapping the stars since the days of Brando and herself being filmed by Warhol, she is one of many colourful characters that feature in this documentary. She and Cunningham talk fondly of days gone by, as Cunningham urges her to show off her work. There is a love and respect between them that is old fashioned, playful and a joy to watch. While the documentary features noted fashion icons like Vogue editor-in-chief Anna Wintour and prominent author Tom Wolfe, it is the lesser known characters like Editta that really give the documentary its vibrancy and charm. All of them lovingly tell stories of Cunningham's importance, unbridled love for fashion and his understanding of the individual need for statement through style. Director Richard Press knows this documentary works through the honesty of its subject. There is no clever editing or Hollywood hype, just a point and shoot aesthetic that runs for the duration of the feature. New York seems even more colourful, while red carpet events seem stylish not garish and everyday people photograph like professionals. This is Cunningham's world and the director gives us a beautiful insight into it. Stories are effectively accompanied by the related photography and the camera is often left on people so they reveal more about Cunningham and themselves. The documentary's only weak point is that it only delves into Cunningham's personal life towards the end of the feature. When asked about his private life, the photographer remains short and withdrawn. When asked of romance, he talks of fashion being his main love in life. In a surprising and very touching moment when Cunningham's talks of his weekly church visit, he breaks down and cries. Showing a much deeper thought than fabric, there is more story to him than is revealed in the documentary, but this is the way the photographer wants it. 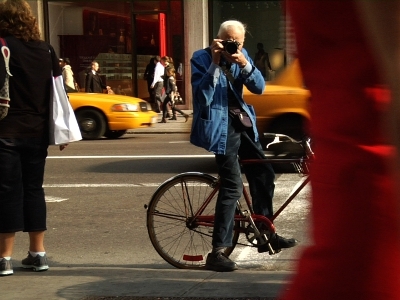 Bill Cunningham New York is about style, poise and individuality. Not just within the fashion world but in the world in which we all exist. Cunningham's unique life experience makes him an informed and interesting subject with a beautiful view on the world. Upon receiving the Order of France for his contribution to fashion he comments, "He that seeks beauty will find it". There is much beauty on display in this documentary. Surprisingly though it comes from the stories, the city and Bill Cunningham himself. Not the clothes or the models. If fashion doesn't hold your interest, this documentary still has much to offer. It will not change your world but it will definitely brighten it. 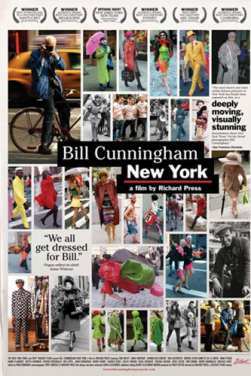 For the fashion conscious or those wanting to get into the industry, Bill Cunningham New York should not be missed.